Matthew, a 30-year-old accountant in Denver, is breaking down the cost-benefit analysis of staying in on a Friday night with a fresh box of Legos. “Sometimes the prospect of sitting on the couch, getting super-high and rewatching Game of Thrones while assembling a Lego Star Wars™ First Order AT-ST is too appealing to pass up,” he tells MEL. He’s not particularly stressed or antisocial. He just enjoys the hell out of putting some bricks together. Not unlike the guys who love puzzles, Matthew has found community in grown men who find the utmost pleasure — whether for stress relief or just analog entertainment — in putting together Legos. From the subreddit r/Lego to the #BrickHeads on Twitter, a growing number of millennial men are forgoing the liquor aisle and heading straight to the Lego aisle on Friday nights. My relationship with Legos began about 24 years ago, when I was 8, at Christmas. That was the first time I got to shake a wrapped gift from Santa and discover the magic of Legos. Fast-forward to my now-32-year-old self: I am still in awe of Legos and every facet of them. Over the past five years, with the encouragement from my fiancée, I rediscovered Star Wars Lego sets. I really enjoy the fancy adult sets; the ones that generally go for $199 and up are always catching my eye. I think I have close to $1,900 in sets so far, and all totaled, I have about a dozen sets of all Star Wars Legos. I just love the vehicles. My personal favorite set is a Super Star Destroyer — it was my first build that took more than a day. When I’m done, I’ll leave them up for display, but once I see a new set I have to have, I’ll take apart the old one and store it. Sometimes I hand them down to either of my two nephews. It’s so great to see the smiles they get when they know I have Legos for them. It’s just so relaxing to spend a night in, grab a drink, turn some music on and build a set. It really puts my mind into a focus mode that can’t really be duplicated anywhere else in my life. It takes me back to that Christmas when I was 8, when I immediately opened the Lego box and disregarded all of my other presents. Now, I open the Legos and I block everything else out. I rediscovered Legos about two years ago, and I’ve bought small-/medium-sized sets whenever I can scrape enough money together, though most of my sets come from my girlfriend. She was there at the moment of rediscovery she saw my eyes light up standing in the Lego aisle. When it comes to particular sets, I have no real preference — as long as it looks cool, I’m gonna love it! Otherwise my collection is pretty small, and follows no real theme. I’ve got a fair bit of Minecraft Lego, one of the Lego City trains, and a few scattered creator sets. When I’m done building, depending on size of the set and the space I have available, I’ll usually put it on a shelf, or put it back in the box. There’s no greater feeling than opening up a box and knowing you’re in for an hour of building. It makes for the perfect Friday night: sprawling out on the floor, organizing all the pieces by color before you start. It’s just a time of pure joy. That’s why I’d never build if I wasn’t in a good mood. I’d hate for the build to be spoiled by that. The great thing is that when you’re building, that’s all you’re doing. You’re totally focused on the build. The way the bricks all slide together so perfectly is so soothing. I nearly get sad when I can see I’m coming to the end of the instruction book. I know it’s nearly over. I want it to go on forever, so I make sure there are no distractions and that I’ll be able to take my time and really revel in it. 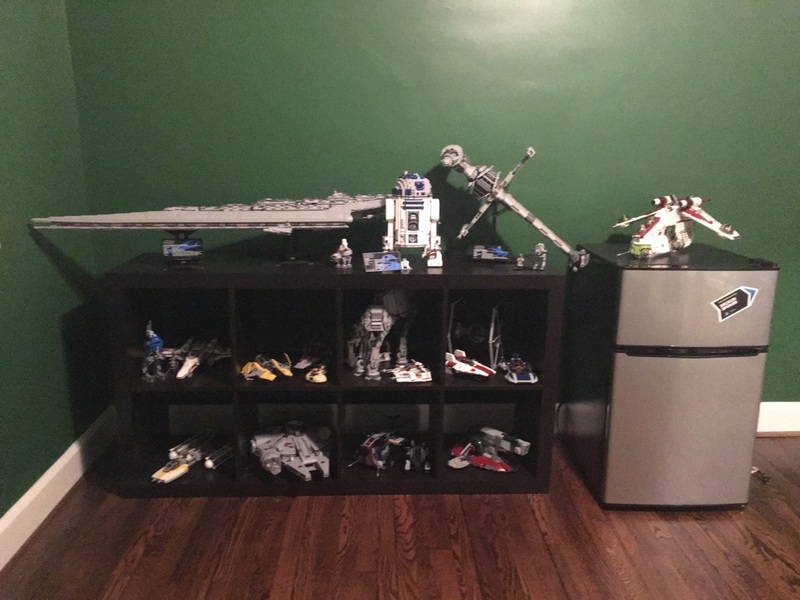 I really got into building Legos from a hobby point of view because of my wife. She used to do the the majority of builds while I would just appreciate the built sets after the fact. Well, this got boring for me pretty fast, and soon thereafter I started collecting some bigger Star Wars and train sets to build myself (the two of us usually split the Harry Potter line). I like displayable sets that have a wow factor or would start a conversation when someone visits my house and see its on a shelf or hanging on the wall. These usually tend to be bigger sets, but I have some found some smaller ones that I could not pass up, and I still have a lot of sets that are still sitting sealed in boxes. I work in finance so when I notice sets going up in value it’s hard for me to open them — especially when I start calculating ROI on them. Like many other fans, Legos have a special place in my heart and reminds me a lot of my childhood. Beyond that, in 2019 when everything is digital, Legos give me an unbelievable analog form of entertainment that resets my brain and helps me maintain balance. At one point during my MBA program, I was stuck while trying to write a marketing case paper. I spent about four hours on it and produced three quarters of a page that was nothing short of pure garbage. I decided to take a break and build a Lego X-Wing. While I was going through the instructions and building the frame of the X-wing, the marketing paper began to form in my mind. About 2.5 hours later, I had a built X-Wing and went to bed a happy man. The next day after work I sat down to work on my paper and finished it in about 90 minutes. The core of why I build remains true but now my older daughters are at an age where they can enjoy building with me and the process has taken on a whole new level of fun. I enjoy building smaller and kid-friendly themes with them (Minecraft, Friends, smaller Star Wars sets) I love seeing their excitement when they finish a set and then hearing their imaginations when they play with the set. After doing all of this I still find myself spending my evenings building the bigger display pieces and showing them off to my girls when I get done with them. This time of year is really made for Lego; it’s cold and gray out and there are a limited number of things to do with a family. I love to simply stay in and build something with my hands that will later go on display in my house a work of art… and there are few art pieces that let you pull them off the wall and turn into a interstellar ninja battle! I grew up with Duplo [children’s Legos], which I still have to this day, then worked my way on to the Lego City sets in 2005. 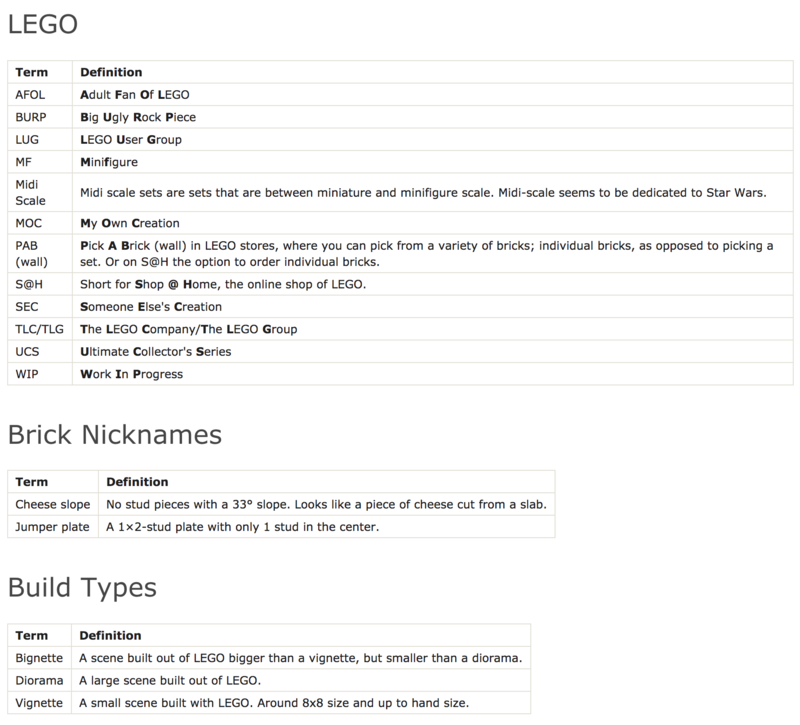 I had a “dark age,” which in the Lego community means a period of falling out of touch with Lego, in 2014, due to exam pressure. However, a year later I was back into collecting again, and as you can expect any AFOL (Adult Fan of Lego) to do is to buy previously missed out sets on the aftermarket. I suspect I will never give up collecting Lego, mainly because it’s something that really eases the pressure and stress in my life. My main theme I roll with is Star Wars. I grew up watching the prequels and my dad introduced me to the original trilogy, then when the clone wars series was introduced in 2008 I switched my Lego consumption from City to Star Wars mainly because I loved the characters, vehicles, themes and events. So ever since 2007 I’ve been collecting Star Wars sets, but I also buy the odd occasional City set which piques my interest, because I’m currently studying urban design, planning and development at uni. The city sets link into my fascination with urban planning, and have helped me in my modules by conveying planning proposals to councillors, lecturers and fellow students. I also collect the Winter Village theme, because every year as I set up a Christmas scene so that the family can see its progress, and overall it makes for a excellent talking point when relatives are around. Overall, the sets I buy are geared toward adults. Well, the price tag is. Especially the Ultimate Collector Series sets. I hate to think how much I’ve spent on Lego my entire life because some would probably think it’s an unhealthy addiction. Altogether, my collection is coming up [toward] £20,000, so I’m sitting on quite an asset — which is why when I eventually get a place of my own I’m investing in fortifications and advanced locks. 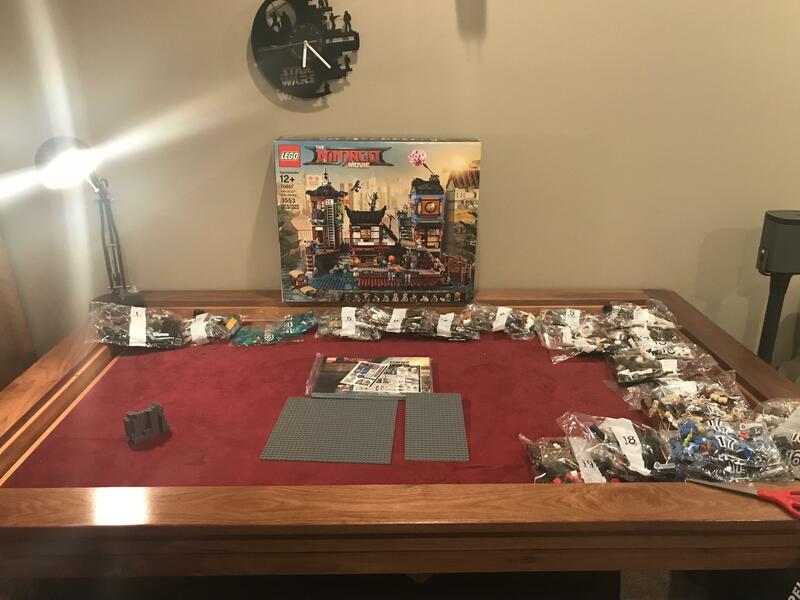 My main goal is to have an entire room dedicated to Lego, in which I can create a massive city with trains, construction sites, hospitals, police stations, waterways, green open space, etc. And to go alongside that, have scenes from my ever-growing Star Wars collection and consider it a massive Star Wars city, whereby districts are actually planets like Kashyyyk, Mustafar, Geonosis and so on. This probably won’t happen until at least another five years. It really depends on whether I land a job in my desired area, which I don’t think will be a major problem, as urban planners are heavily in demand in the U.K.
A fair amount of my building gets done over the weekend, which is great, because I get to focus on two of my most loved activities: A) being warm and safe in my own home, where loved ones know where I am; and B) catching up on my Netflix viewing, such as Black Mirror, and thus being able to talk about the episode with my friends the next day or so. The most important reason to stay in is to finish that newly bought set sitting in the corner. Overall, both Lego building and Netflix watching are major stress-relief devices, which starts the weekend off nicely.